The spread of herbicide resistance has transformed weed control into a complex and costly problem. EDITOR'S NOTE: There are some 250 weed species confirmed to be resistant to at least one herbicide mode or site of action around the world. Even more troublesome is the fact that some weeds are resistant to multiple modes of action, making control even more difficult. Tackle Resistance is a special series designed to help corn and soybean farmers better understand this growing problem and develop appropriate strategies to manage herbicide resistance. There are no simple solutions to herbicide resistance, but there are strategies you can embrace to effectively manage it. We begin a special four-part series to help you understand the complexities of herbicide-resistant weeds and then put together an action plan to tackle the problem head on. For years, weed control was easy for U.S. corn and soybean farmers. Just burn down, plant, spray two or three times postemergence with glyphosate, then go to the house. Glyphosate-resistant technology was that good. Too good to be true, as it turns out. In 2000, the first crack in glyphosate's foundation appeared in Delaware when farmers noticed that horseweed (marestail) was shrugging off the effects of the herbicide. Subsequent tests confirmed resistance. The following year, glyphosate-resistant horseweed had spread to Kentucky and Tennessee. Other outbreaks followed in Arkansas, Indiana, Maryland, Missouri, New Jersey and Ohio. In 2004, the herbicide took two more hits when glyphosate-resistant waterhemp was confirmed just north of Kansas City, Missouri, and glyphosate-resistant Palmer amaranth was discovered in a cotton field in Macon County, Georgia. U.S. producers suddenly faced a grim reality. Weeds were fighting back. Glyphosate resistance, idling in the DNA of Palmer amaranth, marestail, waterhemp and other weeds, was on the move. Over the next 11 years, herbicide resistance transformed American agriculture. "When glyphosate-resistant horseweed came along, we went in two directions," explains Belzoni, Mississippi, farmer Trey Koger, who at that time was the state's Extension soybean specialist. "The easy solution was to add 2,4-D or dicamba to our burndowns. That was the first instance where we had to add something to glyphosate. It was economical and did a good job on the weed. The other option was fall herbicide programs to control horseweed before it emerged." When glyphosate-resistant Palmer amaranth was confirmed in the Mid-South in 2006, "we stopped talking about everything else. It was a game changer," Koger points out. Just like that, weed control went from simple and cheap to complex and costly. "A lot more steel (equipment) and labor started coming to the field," says Koger, who grows corn, soybeans, rice, peanuts and cotton. "From a preemergence standpoint, it changed the amount of equipment, labor and time it required to effectively scout the crop and control the weeds," Koger adds. "From a postemergence standpoint, we had to start managing Palmer amaranth with residual herbicides. Resistance increased our herbicide costs probably four-fold compared to when we were just spraying glyphosate. It's taking a lot out of the bottom line." The scattering of glyphosate-resistant waterhemp and horseweed seed via the Muscatatuck and White rivers in southern Indiana "made one farmer's resistance problem everybody's resistance problem," explains Jeff Davis, who consults and scouts as part of his job as a retailer for Premier Ag in southern Indiana. After resistance appeared, Davis saw local farmers invest heavily in tillage equipment, sprayers and time. "There's more planning at the table in the winter, more time spent on early burndowns and on in-crop applications during the year. The cost of growing the crop has increased over the last 10 years, by at least $45 to $50 an acre. It may be more like $60 in some situations," he calculates. Resistance wasn't as troublesome for Slater, Missouri, soybean and corn producer Brad Hemeyer. He added a residual herbicide and a new cultural practice to his weed control programs after glyphosate-resistant marestail and waterhemp appeared on his farm four years ago. "We have always used residuals (including S-metolachlor alone or with metribuzin) for burndown in soybeans even with glyphosate-resistant crops," he says. "With glyphosate resistance, we are now coming in with an early-post residual, either S-metolachlor and fomesafen, or acetochlor, layered over the previous residual. We want to kill those weeds or prevent them from coming up from the get-go." Hemeyer is also planting a fall cover crop of cereal rye to suppress weed growth between cropping seasons. Hemeyer says weeds are continuing to evolve on his farm. "I've had trouble controlling marestail in a burndown using 2,4-D," he says. "In waterhemp, we are starting to see some tolerance to PPO herbicides." 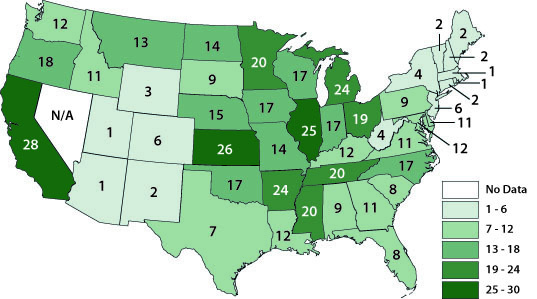 Today glyphosate-resistant Palmer amaranth has invaded over 30 states. Glyphosate-resistant waterhemp and marestail are entrenched in the nation's corn, cotton and soybean producing regions. Other problematic glyphosate-resistant weeds in North America include giant ragweed, common ragweed, Italian ryegrass, Johnsongrass, goosegrass and annual bluegrass. In addition, many weeds now harbor multiple resistance, one consequence of what Arkansas Extension weed scientist Jason Norsworthy calls the resistance treadmill. "The South used the ALS chemistry until it did not work, then switched to glyphosate until that did not work," Norsworthy points out. "Then we used the PPO chemistry until the summer of 2016, when we documented PPO-resistant Palmer amaranth in 12 counties in Arkansas, five counties in Tennessee and one county in Kentucky. Now we expect those three-way resistant pigweeds to spread rapidly." Tennessee Extension weed scientist Larry Steckel says some PPO-resistant Palmer amaranth biotypes found in 2017 near the Mississippi River "are showing tolerance to a lot of herbicides. Even dicamba and 2,4-D weren't all that robust. Those weeds are really concerning us. "It makes us wonder if a broader, metabolic resistance is starting to develop," Steckel continues. "The thinking is that enzymes in the Palmer amaranth that conferred resistance to PPOs have now built up enough to where they can detoxify other herbicides. We're trying to nail it down to see what's going on there. It's absolutely terrifying." Waterhemp has shown resistance to six herbicide groups, (ALS inhibitors, T1R1 auxin receptors, photosystem II inhibitors, PPO inhibitors, EPSP synthase inhibitors [glyphosate] and HPPD inhibitors) notes Aaron Hager, weed scientist with the University of Illinois. Before it acquired resistance to glyphosate in 2004, "waterhemp rendered ineffective an entire class of herbicides, the ALS-inhibitors," he adds. Tennessee's Steckel says resistant weeds can appear in weed populations after only 12 applications of a herbicide, or half dozen or fewer growing seasons, unless other herbicides with different modes of action are introduced to the system. "Those plants go to seed and in a matter of two to three years, the herbicide is no longer effective, and the grower has a significant issue on his hands," explains Dane Bowers, herbicide resistance technical product lead for Syngenta, based in Greensboro, North Carolina. Bowers says other practices that encourage weed resistance include applying lower-than-labeled rates of a herbicide and spraying large weeds. "In both of those cases, we're finding weeds that are not resistant just yet, but they have a higher tolerance," he says. "We take a population that we could control, to one that is hard to control, to one that we can't control." Stephen Powles, renowned weed scientist and director of the Australian Herbicide Resistance Initiative in western Australia, says U.S. farmers are stuck in a herbicide rut. "Growers are so focused on 'what chemical at what rate' is needed to solve these problems. This is not sustainable," he stresses. "We need to move from herbicide-only syndrome, which is alive and well in the United States, to herbicide and diversity. "It's like the bloodshed that used to occur when the blue troops lined up against the red troops and marched at each other in straight lines," Powles explains. "Then somebody created guerilla warfare, which is to never appear in the same spot at the same time. These are the tactics we need against pigweed types and other resistant weeds." If you don't, "nature will eventually begin to adapt to it," says Hager. "That's the nature of selection. That's the nature of evolution. The more diversity you introduce into your system, the less likely it is that any one weed, one insect or one pathogen is going to survive in that environment." A concern for Phil Cochran, a consultant with Cochran Agronomics in Paris, Illinois, is that recent problems with dicamba drift could drive farmers into using a single technology across farms or wide areas, exactly the opposite of what weed scientists recommend for resistance management. "We truly need the dicamba tools, but with the volatility of dicamba and all the political stress that brings with it, it's going to be a problem," Cochran says. "We could have a scenario like what happened with glyphosate-resistant crops in the beginning. You have drift injury, and it's a problem for a while until everyone has switched to glyphosate. I could see the same thing happening with the dicamba-resistant crops. We desperately need that technology to control problem weeds in corn and soybeans." Gordon Vail, corn herbicide technical product lead for Syngenta, agrees. "From an auxin herbicide standpoint, we likely already have resistance developing out there," he notes. "Auxin herbicides have been in our weed control programs in corn for 30 or 40 years. It's a little scary to think that some of the mistakes that led to ALS and glyphosate resistance are now being repeated with the new auxin technologies." Vail doesn't believe farmers have changed agronomic practices all that much in the face of resistance. "They have added more herbicides, but not a lot of non-herbicide tactics," he adds. "During the glyphosate years, they were using postemergence herbicides. Now they've gone to preemergence and residuals, but it is still a herbicide-only based approach in many situations. One thing farmers have adopted is using more modes of action." When weed scientists talk about resistant weeds, the big three, Palmer amaranth, marestail and waterhemp, are usually a big part of the conversation. 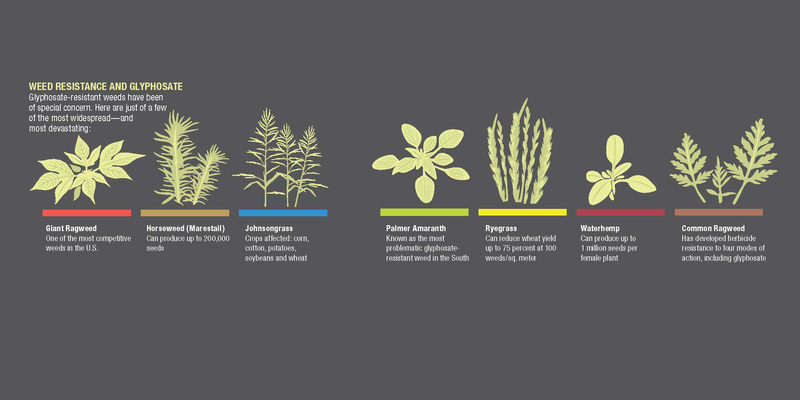 A single Palmer amaranth plant can produce as many as 500,000 seeds in one season, marestail, about 200,000. Waterhemp generally produces 250,000 seeds per plant, but in non-competitive environments can produce as many as 1 million. Marestail seed is small enough to be carried for miles by the wind. 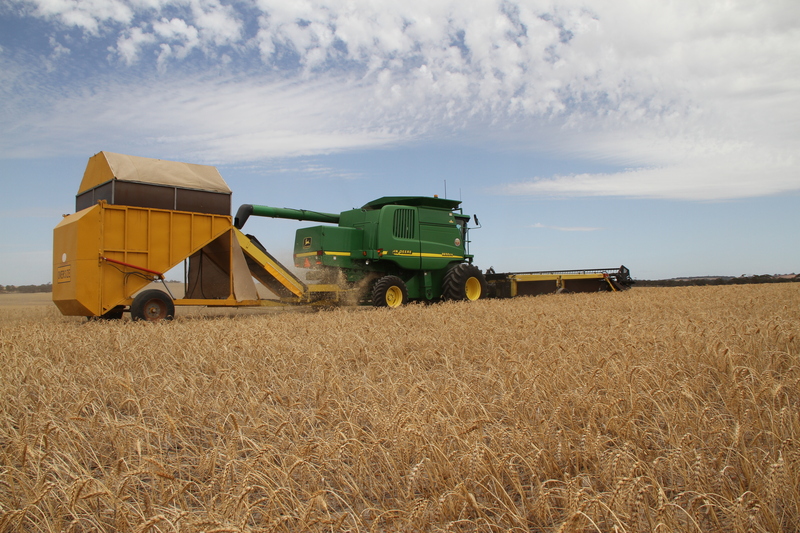 Collecting weed seed in chaff carts and then dumping it in piles to burn is a popular weed control measure in Australia. Making Palmer amaranth and waterhemp even more formidable is that both are dioecious, meaning there are distinct male and female plants. "If you have a female that is going to produce a million seeds, theoretically the female could have pollen donated from a million males," Hager explains. "That's where a lot of the genetic diversity comes in." This is why weed scientists urge farmers to manage the seed as well as the weed. It begins after combining with practices like harvest weed seed control, post-harvest applications and cover crops. An interesting take on this that's being looked at in the U.S. is managing combine chaff, which typically contains a lot of weed seed. A method widely used in Australia is narrow windrow burning, where the chaff from the combine is funneled into narrow rows and burned. To battle resistant weeds, many U.S. farmers are going back to weed control tactics used prior to glyphosate-resistant technology. "It's like we've gone back to the future," says Syngenta's Bowers. "In the pre-glyphosate-tolerant crop days, weed control was fairly complex. We scouted fields. We wanted to know what weeds were in the fields and at what growth stage they were. Then we had to do a prescriptive approach to make sure we had herbicides in the mixture that would control the entire spectrum that was present. All those things are back into play now." Dave Johnson, product development manager for soybeans and traits at DuPont, says producers should concentrate on four concepts for in-season control of resistant weeds: 1) Start clean, either with tillage or burndown to make sure your crop gets off to a good start. 2) Use preemergence, residual products with multiple effective modes of action. This could go back to your burndown program. 3) Make timely postemergence applications. "We used to be able to take down some trophy-sized weeds, but those days are over," he says. "Spray weeds when they're small, four inches or less." 4) Use overlapping residuals with your postemergence herbicide. "We want to get to canopy closure weed free," explains Johnson. But that's not enough to adequately manage resistance. Bowers and Johnson urge producers to add as many non-chemical tactics to their weed control toolbox as possible-proven practices like tillage and newer approaches like zero tolerance. "Tillage, which may not be feasible on erodible land, and cover crops may help us some. We need to look at crop rotation and narrow rows that canopy quickly. We need to think about managing the seed bank with zero tolerance, harvest weed seed control, narrow windrow burning and other techniques." Adds Powles, "The biggest part of managing resistance is realizing that not every solution comes from the end of a spray nozzle. We have to have a diverse, integrated strategy that makes economic sense." Comfortable with your strategy? Change it. To keep weeds off-guard, Powles advises to never get too comfortable with a strategy, even if that strategy is part of an overall diversity program. "Number one, use multiple available herbicides because they are the central plank of your weed control strategies," Powles recommends. "Rotate and diversify your strategies and when you think you have a good thing going, change it up. When you stop chasing just the chemical solution, then you realize that chemical solutions are precious resources, just like antibiotics are in the medical field. If we start using them more wisely, we can do some of these things." "We need to stop thinking about a silver bullet that's going to fix our issues," Bowers says. "We've seen the greatest herbicide that has been invented to date in glyphosate, and maybe the greatest we'll ever see. But we've made it not as effective as it once was. The lesson to learn is there isn't one tactic that is going to solve our issues."